Claude Debussy, photo by Félix Nadar, ca. 1908. Achille-Claude Debussy (August 22, 1862 – March 25, 1918) was a French composer who created within the style referred to as Impressionist music, a term which he dismissed. He might more accurately be referred to as a Symbolist composer. Debussy is considered the most original musical mind of the turn of the century. By turning from the largely Germanic musical syntax of Bach, Mozart, Beethoven, and Brahms to include non-European harmonies—notably Russian and Javanese—Debussy sought a modern music that would convey emotions and appeal to aesthetic sensibilities beyond conventional cultural constructs. Debussy's compositions questioned the very essence of western forms and thematic organization. Disregarding traditional ideas of chord structure and tonality, Debussy sought above all to evoke light, color, nuance, and atmosphere in his works. Debussy was not only one of the most influential French composers but also one of the most important figures in music at the beginning of the twentieth century; his music represented the transition from late-Romantic music to the twentieth century Modernist music. In this, he was a profound influence on composers as diverse as Bartok, Webern, Arnold Schoenberg, and Varese. As Stravinsky stated, "The musicians of my generation and I myself, owe the most to Debussy." Debussy lived during a period of chronic political instability. He abandoned his first wife and maintained affairs with other married women. Only his second wife, Emma Bardac, along with their daughter Chouchou, brought lasting love into his life. Debussy died of cancer at the age of 55 just before Germany overtook his native France in World War I.
Claude Debussy was born in St Germain-en-Laye near Paris, France. His parents ran a china store, with little success, and his father later commanded a battalion on the wrong side of the Franco-Prussian War, for which he went to jail. The family then found themselves destitute and were sustained by the father's sister. The young Debussy spent part of his childhood living with her. These disruptions, compounded by his mother's constant requests throughout his adulthood that he spend more time with her and always work hard, are possibly to blame for much of his reported egoism and awkward social skills. Debussy received piano instruction from Chopin's pupil Madame de Fleurville, and being very gifted, entered the Paris Conservatoire when he was 11 years old. 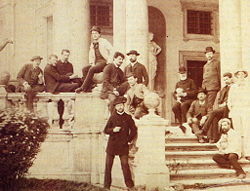 There he studied with Ernest Guiraud, César Franck, and others. He was an unorthodox student, much to the dismay of his teachers, but a talented one, which earned him many prizes. In 1880 he entered into the service of Tchaikovsky's patron Nadezhda von Meck, teaching music to her children for two years and invariably absorbing the trends in local music. In 1884 he won the Prix de Rome prize for L'Enfant prodigue, which secured him a scholarship from the Académie des Beaux-Arts a year later, which included a four-year residence at the Villa Medici, the French Academy in Rome, to broaden his education. His letters from this period reveal that he was prone to depression and was able to compose only sporadically. Four of his pieces were sent to the Academy: the symphonic ode Zuleima (set to a text by Heinrich Heine), the orchestral piece Printemps, Fantaisie for piano and orchestra, and the cantata La damoiselle élue, which the Academy criticized as "bizarre"; on the other hand, those were the first glimpses of some of the stylistic features of his later period. Fantaisie was still indebted to Franck's music and was withdrawn by the composer himself. In Italy he met Franz Liszt, but lack of recognition eventually drove him back to France without his completing his residence. 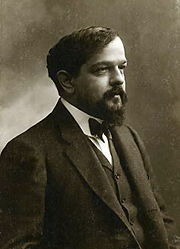 Debussy became a close friend of a wealthy composer and member of Franck's circle, Ernest Chausson. The Chaussons held a salon for famous writers, painters and musicians, and Ernest was an active member on the Societe Nationale de Musique. He also assisted Debussy financially. Debussy's last years of life were marked by a struggle with colon cancer and physical pain; he died in Paris during the final German offensive of World War I. He had been battling the disease from 1909. Since these were hard times for France, just eight months before victory was celebrated, no official honors funeral was held for him. Instead, the funeral procession made its way through deserted streets as shells from the German guns ripped into Debussy's beloved city, laying him to rest at the Cimetière de Passy. Since his death, France has celebrated him as one of the most distinguished ambassadors of its culture, and his music is repeatedly heard in film and television. 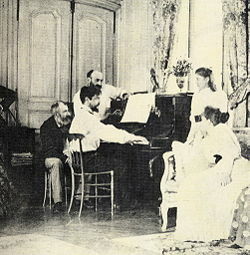 In 1899, Debussy married Rosalie Texier, who was described as not complementary given his cultural taste and experience. While still married to her, he developed a romance with the then-married Emma Bardac, who eventually became his second wife. When Rosalie discovered her husband's affair, she attempted suicide, resulting in many of his friends turning away from him. When Maurice Ravel heard of the breakdown of this marriage, he took pity on Rosalie and reportedly contributed to a fund for her. The relationship with Bardac and his strong feelings for their only child, Claude-Emma, nicknamed Chouchou, brought genuine happiness to the composer's life. He dedicated Children's Corner for piano to his daughter, whose sweetness and love would quell his depressions. She died prematurely when 14 years old, a mere 16 months after her father passed away. Debussy had several affairs with married women prior to his own betrothal. He tended to begin relationships before ending the previous ones. He also developed a reputation as a notorious borrower of money from friends and relatives without bothering to return it, and as a pleasure seeker unwilling to sacrifice. His own words, "I intend to live according to my wishes. ", testify to such dispositions. France in late nineteenth and early twentieth centuries was subject to frequent changes in the political system, and between the Paris Commune of 1871 and World War I alone, the government changed hands 60 times. The economy was devastated in the aftermath of a grapevine disease, Union Générale Bank, to which many farmers had entrusted their savings, went bankrupt, and villagers moved in droves to urban areas. Social relations revolved around caste snobbery, as the old nobility considered themselves superior to the French Second Empire nobility, who in turn looked down upon the financiers and businesspeople. Debussy was born during the second half of the Second Empire (1852–1870), during the reign of Napoleon III, the emperor who paid lip service to the ideals of the Empire, that is, guidance of the people towards justice and peace. He was critical of the previous oligarchical governments for their neglect of social issues, but once in power, he introduced a system centered on himself and that effectively paralyzed parliament, limited the press, and undermined reforms in universal suffrage, education, and associations. The Second Empire was replaced by the Third Republic (1870-1940), defined as a republican parliamentary democracy, which came into being following the collapse of the Empire of Napoleon III in the Franco-Prussian War. The Radical-Socialist Party, founded in 1901, held sway over the country during this period. Governments rarely lasted more than a few months as radicals, socialists, liberals, conservatives, republicans and monarchists vied for power. In 1905, the government instituted the separation of Church and State, amidst a rift between the religious rural France and the secular urban France. It was also the period when the French saw economic growth and a craze for mass entertainment, with the Eiffel Tower attracting crowds of people and Moulin Rouge opening in Montmartre. Then there was a resurgence of anti-semitism, while anarchists became vocal. Debussy's musical style began emerging in full in the 1890s under the influence of Eric Satie, Impressionist painters, who rejected representation in painting, and Symbolist poets, who denounced the importance of ideas. He criticized Realism and programmatic writing, instead envisioning a style that would be to music what Manet, Renoir, and Cezanne were to painting and Stéphane Mallarmé to poetry. Thus was born Impressionism in music. String Quartet in G Minor and the orchestral prelude "L'Apres midi d'un faune," composed between 1893 and 1894, were the first masterpieces of the new style. He aimed to design a new style that would not emulate those of the acclaimed composers, yet his music also reflects that of Wagner, whose operas he heard on visits to Bayreuth, Germany in 1888 and 1889. Wagner's techniques had a lasting impact on Debussy's subsequent compositions; his influence is evident in the "La damoiselle élue" and the "Cinq poèmes de Baudelaire." Nevertheless, the heavy emotionalism exhibited by late-Romantic composers as well as Wagner and his highly elaborate operas was surpassed in Debussy's symbolist opera Pelléas et Mélisande, his sole completed opera. Based on the play by Maurice Maeterlinck, it caught the attention of the younger French composers, including Maurice Ravel. Its understatement and deceptively simple declamation also brought an entirely new tone to opera — but an unrepeatable one. These works brought a fluidity of rhythm and color quite new to Western music. Debussy wrote in smaller, more accessible forms. The String Quartet in G Minor (1893), where he utilized the Phrygian mode as well as less standard scales, such as the whole-tone, paved the way for his later, more daring harmonic exploration. This technique conjures up a sense of floating, ethereal harmony. The poem "The Afternoon of a Faun" by the Symbolist Mallarmé inspired Debussy to write one of his most famous works, the revolutionary Prélude à l'après-midi d'un faune. Here again he bids farewell to a large late-Romantic orchestra, favoring a smaller ensemble that lends itself to an exploration of orchestral colors and timbres of the instruments. Even if Mallarmé himself and Debussy's colleague and friend Paul Dukas were impressed by this piece, which brought Debussy to the spotlight, the work caused controversy at its premiere, and Camille Saint-Saëns thought it lacking any "style" despite its prettiness. Nevertheless, Debussy protested his label as "Father of Impressionism in music," and academic circles too believe that the term might be a misnomer. In a letter dated from 1908, the composer wrote "I am trying to do 'something different'—in a way realities—what the imbeciles call 'impressionism' is a term which is as poorly used as possible, particularly by art critics." His passions ran high whenever he was called 'Le Whistler de la Musique.' Besides, his favorite painters were not Impressionists but pre-Raphaelites, authored by painters such as Turner and Botticelli. Debussy was viewed as a musical heretic. While at the Conservatory he shocked his teachers with unresolved seventh chords, parallel fifths, and counterpoint in parallel motion, to which he responded, "I can only make my own music." And his own music he did, not being subservient to restrictions of Classicism and Wagnerian excesses. Subject matter to him was secondary in importance, whereas light, color, nuance, and atmosphere were superior. To that end he assigned specific effects to individual chords, as a means of projecting color rather than for their relationship to chords that preceded or followed them. Saint-Saëns reportedly advised his friend Fauré to "look at Debussy's pieces for two pianos with words that it is unbelievable and the composer should be barred at all costs from entering the Institut for his atrocities." Saint-Saëns was right to the extent that the Institut sought to maintain the classical harmonies and structures, which Debussy would abandon to bring out tone, color and mood. The composer's greatest works are built on a classical structure, such as a sonata, but they also appear to have been structured around mathematical models, as Howat observed. He suggests that some of Debussy's pieces can be divided into sections that reflect the golden ratio, frequently by using the numbers of the standard Fibonacci sequence. At times these divisions seem to follow the standard divisions of the overall structure; elsewhere they appear to mark out other significant features of the music. The 55-bar long introduction to "Dialogue du vent et la mer" in La Mer, for example, breaks down into five sections of 21, 8, 8, 5, and 13 bars in length. The golden mean point of bar 34 in this structure is signaled by the introduction of the trombones, with the use of the main motif from all three movements applied in the central section around that point. Perhaps the best example of this comes with La cathédrale engloutie. Missing from published editions is the instruction to play bars 7-12 and 22-83 at twice the speed of the remainder, exactly as Debussy did himself on a piano-roll recording. When analyzed with this alteration, the piece then follows Golden Section proportions and is much less daunting to perform. However, Debussy's manuscripts or sketches do not contain any evidence of such calculations. Debussy's harmonies were viewed as radical by his contemporaries but had an impact on almost every major composer of the twentieth century, especially the music of Igor Stravinsky, Olivier Messiaen, Pierre Boulez, Henri Dutilleux and the minimalist music of Steve Reich and Philip Glass. He also held sway on Jazz musicians, most notably Duke Ellington and Bill Evans. Ravel once remarked that upon hearing Debussy's music, he first understood what real music was.. He did find Debussy displeasing, though, not only for his philosophy when it came to human relationships but also because of Debussy's recognition as the composer who developed Avant-Garde music, which Ravel maintained was plagiarism of his own Habanera. Another major influence on his style was the Javanese gamelan, an orchestra comprising bells, gongs, and percussions, which he became familiar with in 1889 thanks to his artistic contacts in Paris. He became mesmerized by it, as did Ravel. Although direct citations of gamelan scales, melodies, rhythms, or ensemble textures are not noticeable in any of Debussy's own compositions, the equal-tempered pentatonic scale appears in his music of this time and afterward. As Ewen noted, Debussy's sensitive and refined melody was achieved through the use of these exotic oriental scales, church modes, and his signature whole-tone scale. He was the only composer to use the whole-tone scale, made up entirely of whole tones and the octave divided into six equal parts, to such an extent and with such artistry. This enabled him to convey nebulous and haunting melodies, whose textures, sensations, images, and nuances in sound were unprecedented in his time. To cite Rudolph Réti, Debussy's greatest accomplishment was the enrichment of monophony based melodic tonality with harmonies that differed from those of harmonic tonality. He established a new concept of tonality in European music, exemplified by the frequent use of long pedal points; glittering passages and webs of figurations which distract from an occasional absence of tonality; parallel chords that function more as chordal melodies and enriched unisons rather than harmonies per se; bitonality or bitonal chords; the whole-tone scale; and unprepared modulations. The three Nocturnes for Orchestra, Pelleas and Melisande, La Mer, and Images established his reputation as one of the most influential composers in post-Wagnerian and the twentieth century music. Unlike in his earlier work, Debussy's later works freely exhibit discords that were previously hidden in lush harmonies. His harmonies and Chord progressions employ dissonances without any formal resolution. The forms are far more irregular and fragmented, and the whole tone scale dominates much of his compositions from this period. Debussy's last orchestral work, the ballet Jeux, written for Serge Diaghilev's Ballets Russes, contains some of his strangest harmonies and textures in a form that moves freely over its own field of motivic connection. At first Jeux was overshadowed by Igor Stravinsky's The Rite of Spring, composed in the same year as Jeux and premiered only two weeks later by the same ballet company. However, decades later, some composers noticed the parallels to Anton Webern's serialism. Other late stage works, including the ballets Khamma and La boîte à joujoux were left with the orchestration incomplete and were later completed by Charles Koechlin and André Caplet, who also helped Debussy with the orchestration of parts of Images pour orchestre and Le martyre de St. Sébastien. The second set of Preludes' for piano features Debussy at his most avant-garde; dissonant harmonies evoke moods and images. In the mysterious Canope — the title refers to a burial urn which stood on Debussy's working desk—he resurrects distant past so eloquently that pianist Claudio Arrau called the piece one of Debussy's greatest preludes: "It's miraculous that he created, in so few notes, this kind of depth." Études, the last two volumes of works for the piano, drew on similar varieties of style and texture and included pieces that pushed the irregular form to an extreme as well as those influenced by the young Stravinsky. The sonatas of 1915-1917 display a sudden shift in style. They are reminiscent of Debussy's earlier music while, at the same time, forward-looking with their leaner, simpler structures. The chords retain their richness though. This shift parallels Neo-Classicism, a musical style that came in vogue after Debussy's death. Debussy died before he could complete a planned set of six sonatas. Claude Debussy, along with other notable composers such as Igor Stravinsky, sought to explore new and innovative ways to expand harmonic language and in so doing move away from the Germanic influence of the previous two centuries. It was their view that Western harmony had exhausted it potentialities as a potent emotive syntax by the end of the nineteenth century. Like Stravinsky, he looked for inspiration in non-European harmonies, which he incorporated in his music, without rendering it "heathenish," in the sense of undermining its synchronization with the physics of sound. Having heard the sounds of Javanese gamelan music in Paris in 1889, Debussy became enamored with the exotic harmonic, rhythmic, melodic and orchestrational characteristics of this decidedly non-Western music and began incorporating these elements into his compositions. This was viewed as a radical departure form the Teutonic influences of Bach, Beethoven and Brahms. Suite bergamasque (1890) — recalls, in Verlainian fashion, Rococo decorousness with a modern cynicism and puzzlement. This suite contains one of Debussy's most popular pieces, "Clair de Lune." Estampes (1903) — give impressions of exotic locations, such as an Asian landscape in the pentatonic "Pagodes," and of Spain in "La soirée dans Grenade"
Images pour orchestre (1905-1911) — the three Images are loosely linked, with the largest, Ibéria, being a triptych, a medley of Spanish allusions and fleeting impressions. ↑ Steve's Debussy Page. Canope (Preludes, Book II, 1913). Retrieved June 10, 2008. ↑ see Golliwog's Cakewalk by Charles T. Downey, Ionarts, 25 February 2004. Retrieved June 10, 2008. Barraqué, Jean. Debussy (Solfèges), Editions du Seuil, 1977. ISBN 2020002426. Ewen, David, (Ed.) The Complete Book of Classical Music. London: Hale, 1966. ISBN 0709038658. Fulcher, Jane (Ed.) Debussy and His World. Princeton University Press, 2001. ISBN 0691090424. Howat, Roy. Debussy in Proportion: A musical analysis. Cambridge University Press, 1983. ISBN 0521311454. Reti, Rudolph. Tonality, Atonality, Pantonality: A study of some trends in twentieth century music. Westport, CT: Greenwood Press, 1958. ISBN 0313204780. Steen, Michael. The Lives and Times of the Great Composers. Cambridge, UK: Icon Books, 2003. ISBN 1840464852. Trezise, Simon (Ed.) The Cambridge Companion to Debussy. Cambridge University Press, 2003. ISBN 0521654785. Claude Debussy Musical Scores, International Music Score Library Project. This page was last modified on 3 October 2018, at 21:03.